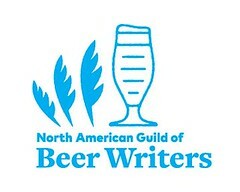 ... a monthly event for the beer blogging community begun by Stan Hieronymus at Appellation Beer, and co-moderated with Jay Brooks at the Brookston Beer Bulletin. To participate, write a blog piece (500 to 1,000 words would be fine), then link to it here, today, as a comment. After all submissions are in, I'll collate, analyze, comment, summarize, and link back. Some non-bloggers have responded and sent comments. 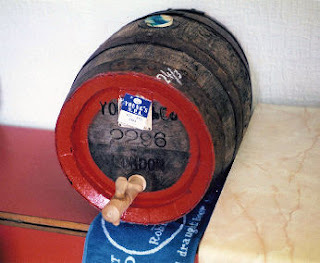 If you have some, include photos of casks, of imbibing their contents, of filling them. My thanks go to Stan Hieronymus and Jay Brooks. They have organized, encouraged, and gently cajoled to get this resource —The Session: Beer Blogging Friday— on the web, each month since March of 2007. UPDATE. The summary post: here. How I announced The Session, way back on 5 January: here. 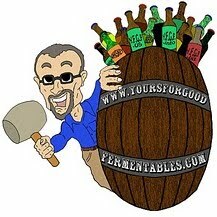 Alex Hall, of the Gotham Imbiber, posted this very useful how-to for running a cask beer festival in the US (or anywhere): American cask beer festivals: my story - and your D.I.Y. guide. My somewhat equivocal post can be found here. Thanks a lot for fulfilling your hosting duties, and for the topic prompt. My post is here for the Brew Site. Thanks for hosting! Alexander D. Mitchell IV has been the Baltimore hack--er, columnist for Mid-Atlantic Brewing News for the past five years, and has in part Tom C. to blame for that fact. A native of Selinsgrove, Pennsylvania, he reside in Baltimore with his wife Jenny Heidewald. He dabbles in free-lance railroad writing, photography, and historical preservation, and is part owner of three preserved British high-speed passenger diesel locomotives. **Session #36: Start with the host. Here's mine, which I started Friday, but didn't finish until now because of SF Beer Week. Thanks again for hosting.